Gudvangen, Sogn og Fjordane is home to the beautiful Vang Camping, an intimate campsite, located a river/stream. In the hustle and bustle of everyday life, everyone needs space to enjoy the great outdoors and a little relaxation. And this campsite certainly offers you space. Camping offers pitches without shade and pitches with some shade. Spaciously laid out camping pitches make it possible to camp in a quiet and pleasant way. A stay here will bring guaranteed rest, space and freedom. This campsite is entirely free from noise and nuisance from discos and clubs, so you can relax and enjoy the peace and quiet. Enjoy the countryside. This campsite is located by a river/stream. A perfect place for those who enjoy playing around in the water. You will want for nothing on this campsite. The campsite also boasts a Communal barbecue area. Nothing says holiday like a gathering around the barbecue! For those who wish to make contact with the outside world, you can access the internet with your own laptop in 80% of the camp site. All in all, the intimate, friendly nature of this campsite make it the ideal location for a carefree holiday. Een mooi vlak terrein langs de 16. Op het terrein staan verschillende hytter. Het sanitair is schoon maar simpel. Er si veel plaats op keurig geschoren gras. De hulpvaardigheid is 100%. Van hieruit ben je snel in Laerdal en in Flam. Verder is er de beroemde 24,5 kilometer lange Laerdaltunnel om de hoek! Machtig mooie ligging, wel een echte doorreiscamping. Nostalgisch sanitair, wel heel schoon. Vlakbij Nearoyfjord. Would you like to book Vang Camping or request more information? You can do both using the information below. 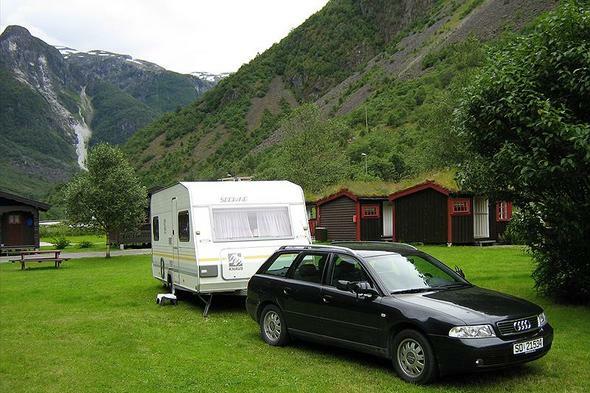 'Vang' campsite is located on the E16 near Gudvangen. The name is clearly displayed on the reception building. Greatlittle Campsites will send your information request to "Vang Camping".